SLO Wine Country’s annual Roll Out the Barrels event highlights the wineries of California’s Central Coast. 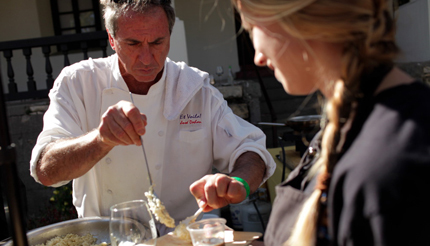 The three-day event (2018 dates are June 21-23) kicks off with Barrels in the Plaza at the historic Mission San Luis Obispo de Tolosa in downtown San Luis Obispo, featuring small bites from local chefs and restaurants, music, and wine tasting from coastal wineries. The two-day Passport to SLO Wine Country features special events at member wineries throughout Edna Valley, Arroyo Grande Valley, Cambria, and Paso Robles. Like a good vintage wine, the SLO Wine Country Association’s annual “Roll Out the Barrels” festival continues to improve with time. Enjoying wine, food, and the friendly atmosphere at Barrels in the Plaza at the Mission San Luis Obispo de Tolosa. While we think of the vibrant Central Coast wine region and its ever-increasing reach and recognition as always being so, there was a time before AVAs and before the quality of our cool coastal climate grapes were known beyond the valleys where they grew. 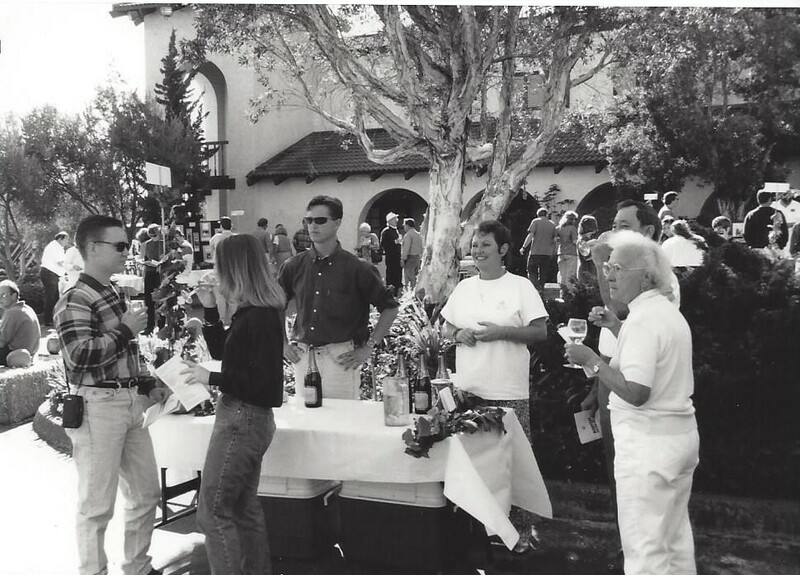 In 1990, closely following the designation of the Edna Valley AVA and Arroyo Grande Valley AVA, SLO Wine Country was founded and began its mission: to spread the word about our coastal region wines and wineries. About eight area wineries joined the new SLO Wine Country association, which now has more than 30 members. “When we formed in 1990, we wanted to reach out to consumers and share information about the area and the quality wines being produced here,” shared Heather Muran, Executive Director with SLO Wine Country. Brainstorming and planning resulted in the first Roll Out the Barrels event, with the goal to build awareness of the AVAs and to begin building awareness of the local Central Coast wines. How far it has come since then, and yet how wonderfully close it has stayed to its roots of sharing great wines and education in a fun, friendly, hometown atmosphere. 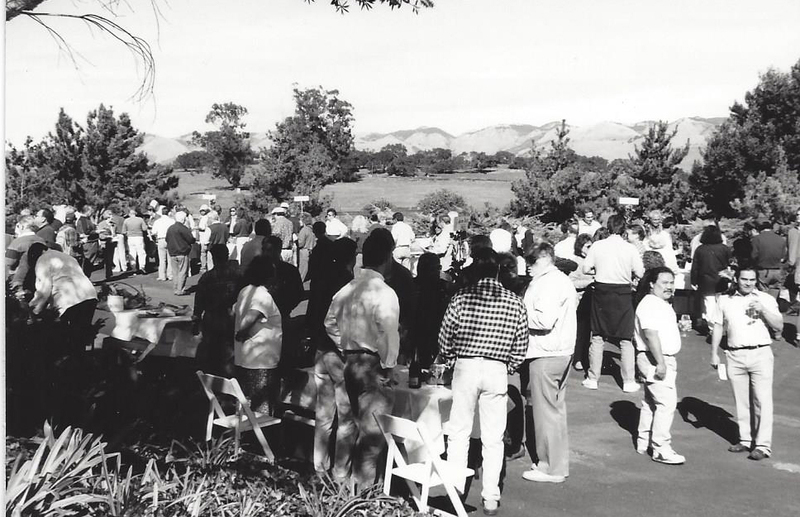 The 1990 inaugural Roll Out the Barrels was held at the former Corbett Canyon Winery (now Center of Effort). “They set up tables in the driveway and maybe 100 or so attendees came to sample wines from Corbett Canyon and a handful of other area wineries,” said Muran. Just one of the small bites to accompany coastal wines at Barrels in the Plaza. 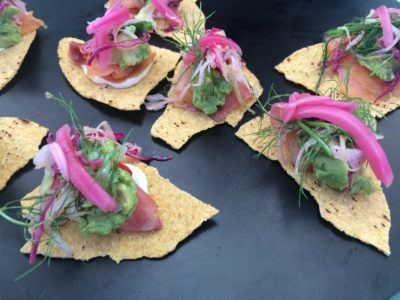 The event brings together a flavorful experience. 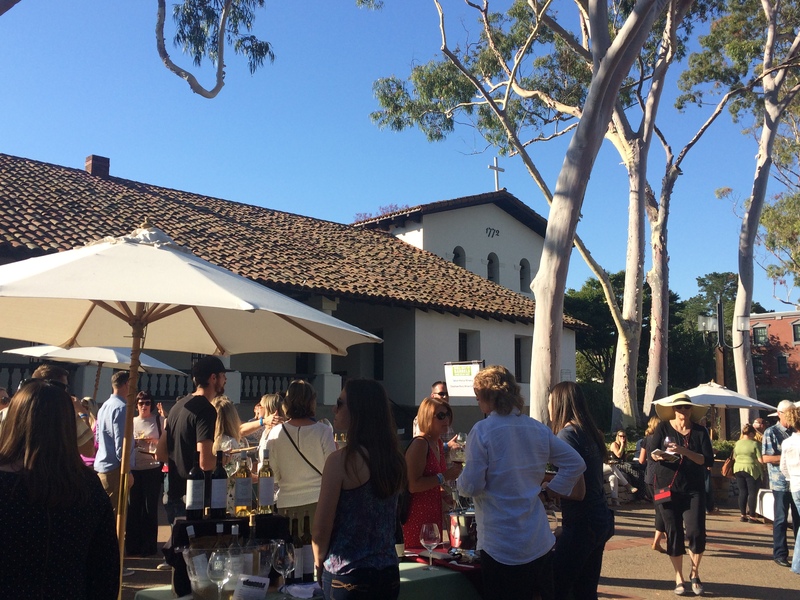 “You can taste barrel samples, talk to the winemakers, learn more about winemaking, enjoy food from top local chefs and caterers, listen to music by a local band, and just enjoy an evening out in downtown San Luis Obispo,” added Muran. In fact, education is an exciting part of Barrels in the Plaza. Seminars cover a range of winemaking topics, from climate and viniculture to grapes and cooperage. Barrel Toasting and Cooperage Demonstration: Using 3-year seasoned oak harvested from the region of Allier in Central France, expert cooper Salvador Canchola from Tonnellerie Ô will demonstrate the art behind building, shaping, and toasting a wine barrel. He’ll answer questions, and attendees will enjoy a tasting of SLO Coast wines as winemakers share how barrel toasting plays a part in the winemaking process. Biodynamics 101, Or As Much As We Can Discuss About a Complex Topic in 15 Minutes: Bob Lindquist, winemaker from Qupé & Verdad Wine Cellars, discusses the process behind Biodynamics, a holistic manner of farming and viticulture that started in the 1920s. He’ll share a flight with wines made within this approach to showcase the results. While Barrels in the Plaza comes to an end Thursday evening, the weekend of wine tasting and education is just beginning. The Passport to SLO Wine Country allows holders to visit four wineries on both Friday and Saturday, for a total of eight. “The Passport experience usually offers more than the usual tasting flights at each winery,” said Muran. The 4×2 Passport offers special events at area wineries. 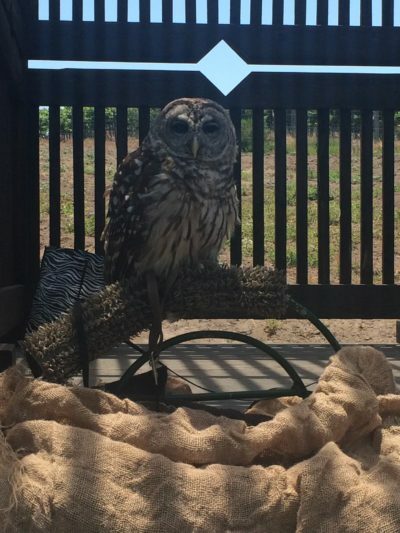 One year, several wineries hosted animals from Paso Robles-based Conservation Ambassadors. “There may be barrel samples of their various wines, some offer reserve and library wines or vertical and horizontal tastings. Some will take passport holders on vineyard tours, provide educational opportunities (wine aroma bar, anyone? ), or offer wine-themed games,” she said. Many wineries have live music and food trucks or caterers. Whether you choose Barrels in the Plaza, the Passport to SLO Wine Country, or the whole wine-focused weekend flight, it’s sure to be an event to remember.